Qualcomm sdm450 snapdragon 450 is a low-end processor from Qualcomm and it is very popular in mid-range smartphones. This SOC has been adopted by so many smartphone brands such as Samsung, LG, Xiaomi and so on. The SOC plays a very important role for any smartphone performance, connectivity, photography and videography and so on. In 2019, there are still so many mid-range phone that using 450 SOC. And since they are cheap and offer best value for money the device, it is very popular among users who are using the smartphone for the first time. Qualcomm sdm450 snapdragon 450 offers everything that a new user will expect from their first buy smartphone. It is very power efficient chipset and has a good battery life. The 14nm process is enough to do the day-to-day activities including using multimedia, gaming, connectivity, internet browsing etc. smoothly. It comes with Adreno 506 GPU which can handle most of the games (not HD or 4k HDR games) easily. Qualcomm Snapdragon 450 chipset smartphone has direct comparison with Snapdragon 625 but the price difference the smartphones using these chipsets are big. So, while reviewing Qualcomm sdm450 snapdragon 450, we will also make a comparison with Qualcomm Snapdragon 450 vs Qualcomm Snapdragon 625. The Snapdragon 450 is an Octa-Core CPU processor with eight ARM Cortex-A53 cores at 1.8 Ghz frequency. On the other hand, Snapdragon 625 frequency can go up to 2.0 Ghz. 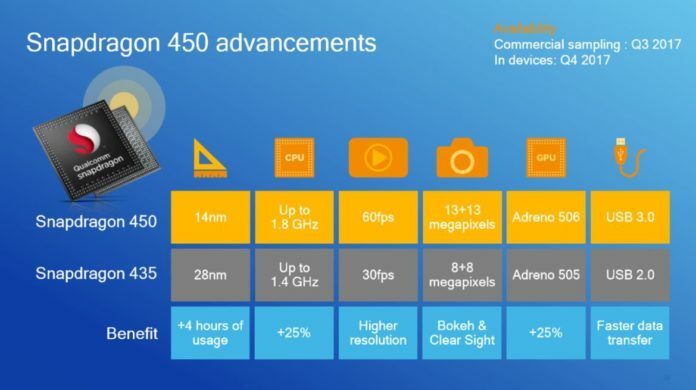 The predecessor of 450 that was Qualcomm Snapdragon 435 also has eight-Cortex-A53 cores but it runs on 1.4 Ghz frequency. The Snapdragon 450 uses Adreno 506 GPU that uses Single-Channel LPDDR3 RAM and Hexagon 546 DSP. It uses Qualcomm X9 LTE modem that support download speed of up to 300Mbps. 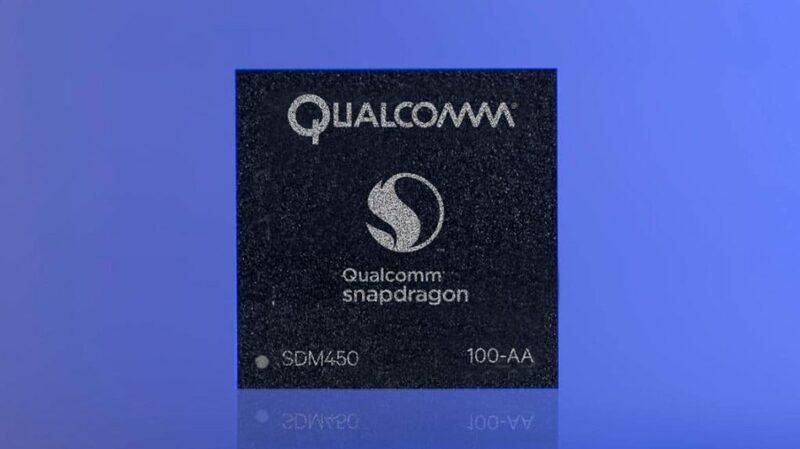 The snapdragon 450 supports fast charging but most the smartphones manufactures using this SOC are not offering quick charging with 450 in order to make their device cost –effective. The 450 does support dual camera technology and can use dual cameras up to 13 + 13 MP. This improves the image processing capabilities and allows taking bokeh effect pictures. It supports USB 3.0 and Bluetooth version 4.1. You can easily examine from the above image is that Snapdragon 450 is very power-efficient as compared to 435. The higher clocking of CPU cores also makes a huge difference. Both CPU and GPU performance is boosted by 25% as compared to Snapdragon 435. As already mentioned earlier, both 450 and 625 SOC are similar chipset but the difference is in their clock speed. Both uses ARM Cortex-A53 cores but 450 can go up to 1.8 Ghz and Snapdragon 625 can go up to 2.0 Ghz. You will not notice a major difference in normal day-to-day activities unless you play too many high graphics based games on your smartphone. The Adreno 506 GPU processor used in 450 delivers a decent graphic experience to the users. Most of the Android games is handled without any major lags. Since, Qualcomm sdm450 snapdragon 450 is primarily used on low-end smartphones; it offers best value for money.